If you love French Silk pie and its fluffy, delicious whipped cream taste that mingles heavenly with its chocolaty filling, this French Silk flavored coffee will hit the spot. With a dark chocolate overtone that hints at a sweet, buttery flaky crust and a silky, smooth whipped cream flavor, this French Silk coffee features only 2 calories per cup and a world of heavenly smooth chocolate. With a strong aroma that smells like a freshly cut piece of French Silk pie, you and your taste buds will fall in love with this decadent treat! A heat-sealed valve bag will ensure the freshest coffee, which will also be fresh roasted and shipped on the same day! 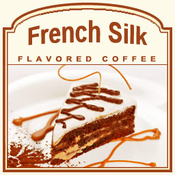 For a true silk pie experience, look no further than the French Silk flavored coffee and all of its sweet-tooth fulfilling cupping characteristics!